MOUNT PROSPECT, ILLINOIS, (OCTOBER 27, 2016) – Today the RAGÚ® brand announced it will kick off the celebration of its 80th year (2017) in a BIG way—with a float in the 128th Rose Parade® presented by Honda®! Participating in the parade is a first for the brand and, on January 2, 2017, spectators will watch RAGÚ pasta sauce pay tribute to its Italian founders, the family farmers who grow their ingredients, as well as the sauce makers and consumers who have made RAGÚ pasta sauce America’s favorite. This tribute, entitled “Simmered in Tradition,” is a lush floral tableau that shares the brand’s inspiring success story through the past, present and future. RAGÚ pasta sauce invites consumers who have enjoyed the brand’s iconic and delicious sauces over the past 80 years to help ring in the next 80. After all, the best recipes are those that combine both old and new traditions. To bring this 80th anniversary vision to life, the RAGÚ brand partnered with Paradiso Parade Floats and its renowned designer, Charles Meier. “The RAGÚ team requested the ‘reddest float in the parade’ to highlight the vine-ripened, California-grown tomatoes that go into every jar of their pasta sauce. We delivered a float design that invites spectators to see, smell and savor the brand’s long-standing tradition of great taste,” said Meier. To highlight the ripe, California-grown tomatoes that infuse every jar of RAGÚ red sauce with its trademark flavor, 50 oversized tomatoes will grace the RAGÚ float. Tens of thousands of red roses and more than 25,000 carnations will create these larger-than-life tomatoes. The float design also makes use of fresh vegetables including garlic, zucchini, peppers and eggplant – staples of Italian home cooking. Herbs like basil, fennel and oregano, used in many taste-tempting RAGÚ sauces, can also be found onboard the RAGÚ float. A gigantic, fanciful tomato vine winds throughout the design, weaving past, present and future together and reminding viewers that a great sauce, like a RAGÚ sauce, always starts with great ingredients. The RAGÚ story begins at the rear of the float. This depicts the brand’s rich past when, during the Great Depression, the Italian-born founders Assunta and Giovanni Cantisano began selling their homemade pasta sauce made from ingredients they picked fresh from their backyard garden. From their home in Rochester, New York, where RAGÚ was first sold, they created an indelible partnership. With hard work and dedication, the sauce they created grew into a beloved household name. “The RAGÚ pasta sauce you enjoy today is Assunta and Giovanni’s legacy to us, the echo of their runaway success that really changed what Americans eat,” said Colleen Nash, Senior Brand Manager at Mizkan America, Inc., the makers of RAGÚ sauces. 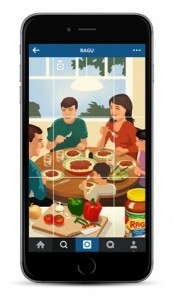 In an effort to recognize everyone who has contributed to eight decades of the RAGU success story—from the farmers to the sauce makers and consumers—the middle of the float features a family dinner table. Seated at the table will be California-based family farmers from the Muller Ranch, who will share an al fresco pasta meal on the “Simmered in Tradition” float. “For three generations in California’s Central Valley, the family at the Muller Ranch has cultivated the flavorful, vine-ripened tomatoes used in RAGÚ sauces. We are honored to celebrate their important contribution to the RAGÚ brand’s success by having them join us for this year’s parade,” said Nash. For the past 35 years, RAGÚ sauce has been made with 100 percent vine-ripened, California tomatoes and cultivated on family farms, like the Muller Ranch, and then carefully simmered to perfection just miles away from the fields where they grow. 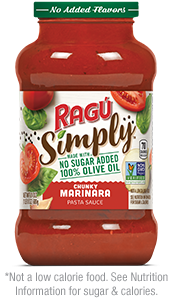 “My father, son and I have worked in partnership with RAGÚ for decades selecting the tomato varieties we plant each year and working together to ensure our tomatoes reach the sauce makers at the peak of flavor. We’re proud to be part of the RAGÚ team and thrilled to be part of the brand’s 80th anniversary celebration,” said Frank Muller. The front of the float promises pasta lovers from coast to coast a delicious sight in the form of a steaming plate of spaghetti topped with RAGÚ sauce. “Spectators’ mouths will be watering as they watch the float pass by—that’s because a giant plate of spaghetti will actually be steaming!” said Nash. Assunta’s recipe book rests close by, a reminder of the rich history of the RAGÚ brand and the sauce-making traditions carried forward to today and tomorrow. To help the RAGÚ brand gear up for the launch of the milestone 80th anniversary year, the brand invites RAGÚ lovers to join in the spirit of the celebration. To make it even more exciting, one lucky person and a guest will be offered a once-in-a-lifetime trip to Pasadena to see the 2017 Rose Parade® in person. RAGÚ fans can enter for a chance to win by flaunting their homemade “float” on Facebook. 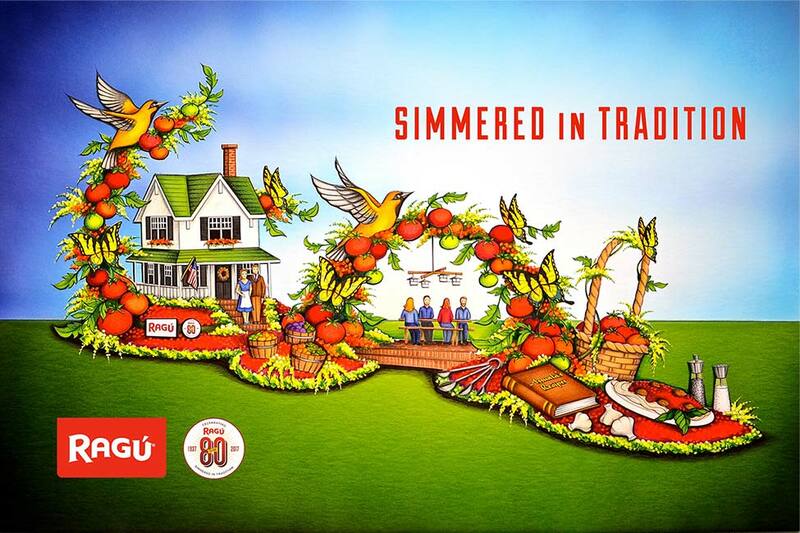 To learn more about the RAGÚ brand’s 80th anniversary celebration at the 128th Rose Parade® and beyond, visit www.RAGU.com and follow along on Instagram, Pinterest, Facebook and Twitter. No purchase necessary. The RAGÚ® brand was founded in 1937 by Assunta and Giovani Cantisano and their sauce was originally sold from their home in Rochester, New York. Assunta carried her family’s recipe from Italy when she immigrated to New York in 1914, and it has now been enjoyed by American families for 80 years. With a wide selection of sauce varieties ranging from the beloved Old-World Style to Organic and Homestyle, RAGÚ® sauce is always “Simmered in Tradition.” Today, RAGÚ® sauce is the go-to pasta sauce for families coming together to share a quick and delicious meal. For the very latest news, recipes and more from the RAGÚ® brand, please check out the brand at www.RAGU.com. You can also follow along on Instagram, Pinterest, Facebook and Twitter. Based in Mount Prospect, IL, Mizkan America, Inc., is a subsidiary of the Mizkan Group, a global, family-owned company that has been Bringing Flavor To Life™ for more than 200 years. As one of the leading makers of condiments and sauces in the United States, Mizkan America maintains 17 manufacturing facilities that serve the retail, foodservice, specialty-Asian and food-ingredient trade channels. Since 2005, Mizkan America has seen dramatic growth and their portfolio now includes a wide variety of vinegars, Italian and Asian sauces, peppers, cooking wines, wine reductions, sushi seasoning, salad dressings and mustards. Mizkan America brands include: RAGÚ® , Bertolli®, Holland House®, NAKANO®, Four Monks®, Barengo®, Mitsukan®, Tres Hermanas®, Nature’s Intent® and World Harbors®. Mizkan America is also the exclusive distributor for Angostura® Bitters in North America. For more information about Mizkan America, please visit: www.Mizkan.com. The Tournament of Roses is a volunteer organization that annually hosts America’s New Year Celebration® with the Rose Parade® presented by Honda, the Rose Bowl Game® presented by Northwestern Mutual and a variety of accompanying events. 935 volunteer members of the association will drive the success of the 128th Rose Parade, themed “Echoes of Success,” on Monday, January 2, 2017, followed by the 103rd Rose Bowl Game. For more information, visit www.tournamentofroses.com. Like us on Facebook and follow us on Twitter, Instagram and YouTube and visit our blog at blog.tournamentofroses.com. The Muller Ranch is a family farm started in 1967 by Joe Muller, Sr., a Swiss immigrant who traded his dairy farm in the Santa Clara Valley of California for some prime Yolo County, California farmland. Today, the farm is operated by the second and third generations of Muller farmers and produces a bounty of tomatoes, peppers, cucumbers, garlic, walnuts and almonds using conventional and organic farming practices. The vine-ripened tomatoes destined for RAGÚ® sauce have been cultivated on the farm for over 20 years. The Muller Family is proud of their focus on sustainability, diversity and quality. For more information, please check out their farm at www.mullerranch.com or visit their Instagram account at Californiafarmsandranches.